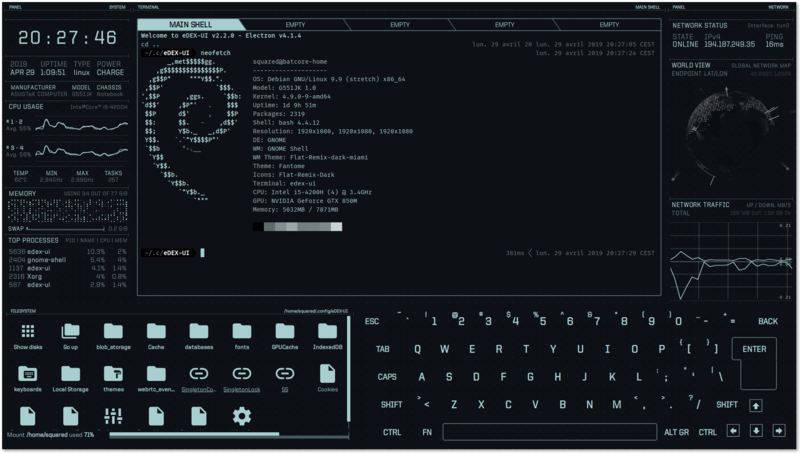 eDEX-UI is a fullscreen, cross-platform terminal emulator and system monitor that looks and feels like a sci-fi computer interface. 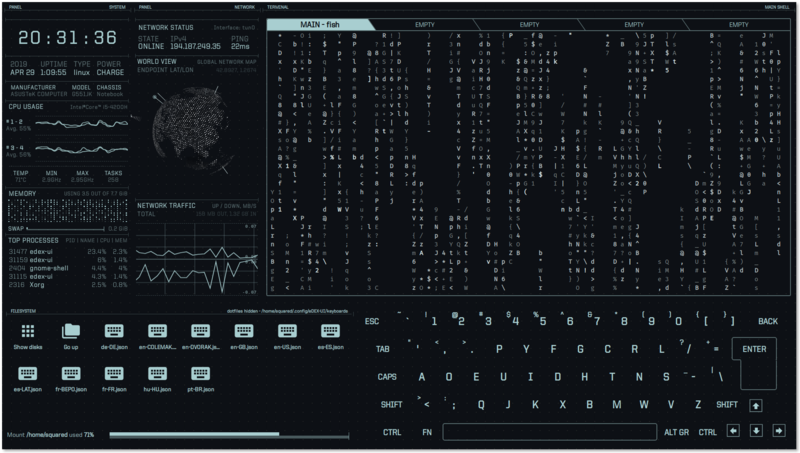 Heavily inspired from the TRON Legacy movie effects, the eDEX-UI project was originally meant to be "DEX-UI with less « art » and more « distributable software »". While keeping a futuristic look and feel, it strives to maintain a certain level of functionality and to be usable in real-life scenarios, with the larger goal of bringing science-fiction UXs to the mainstream. It might or might not be a joke taken too seriously. Fully featured terminal emulator with tabs, colors, mouse events, and support for curses and curses-like applications. Real-time system (CPU, RAM, processes) and network (GeoIP, active connections, transfer rates) monitoring. Full support for touch-enabled displays, including an on-screen keyboard. Directory viewer that follows the CWD (current working directory) of the terminal. Advanced customization using themes, on-screen keyboard layouts, CSS injections. See the wiki for more info. Optional sound effects made by a talented sound designer for maximum hollywood hacking vibe. Where can I find download links? Click on the little badges under the eDEX logo at the top of this page, or go to the Releases tab. Search through the Issues to see if yours has already been reported. If you're confident it hasn't been reported yet, feel free to open up a new one. If you see your issue and it's been closed, it probably means that the fix for it will ship in the next version, and you'll have to wait a bit. Can you disable the keyboard/the filesystem display? You can't disable them (yet) but you can hide them. See the tron-notype theme. On Linux and macOS, eDEX tracks where you're going in your terminal tab to display the content of the current folder on-screen. Sadly, this is technically impossible to do on Windows right now, so the file browser reverts back to a "detached" mode. You can still use it to browse files & directories and click on files to input their path in the terminal. eDEX seems to be pretty stable now. What are you planning to do next? I'm not done with this software just yet. I'm actively working on exciting new features that will make eDEX less of a gadget and more of a usable sysadmin tool. Notably, I'm researching remote monitoring, multi-monitor support, and a plug-in system which would externalize the module structure used internally. Is this repo actively maintained? Glad you're interested! See #272. Thanks! If you feel like it, you can buy me a coffee to encourage me to build more awesome stuff. BoingBoing article - Apparently i'm a "French hacker"
IMPORTANT NOTE: the following instructions are meant for DEVELOPERS ONLY. If you're just a casual user please download the precompiled binaries available on the Releases tab. Note: Due to native modules, you can only build targets for the host OS you are using. The script will minify the source code, recompile native dependencies and create distributable assets in the dist folder. Currently, development is done directly on the master branch. The version tag on this branch is the version tag of the next release with the -pre suffix (e.g v2.6.1-pre), to avoid confusion when both release and source versions are installed on one's system. I use gitmoji to make my commit messages, but I'm not enforcing this on this repo so commits from PRs and the like might not be formatted that way. Dependabot runs weeekly to check dependencies updates. It is setup to auto-merge most of them as long as the builds checks passes. eDEX-UI's source code was primarily written by me, Squared. If you want to get in touch with me or find other projects I'm involved in, check out my website. PixelyIon helped me get started with Windows compatibility and offered some precious advice when I started to work on this project seriously. IceWolf composed the sound effects on v2.1.x and above. He makes really cool stuff, check out his music! Of course, eDEX would never have existed if I hadn't stumbled upon the amazing work of Seena on r/unixporn. This project uses a bunch of open-source libraries, frameworks and tools, see the full dependency graph. I want to namely thank the developers behind xterm.js, systeminformation and SmoothieCharts. Huge thanks to Rob "Arscan" Scanlon for making the fantastic ENCOM Globe, also inspired by the TRON: Legacy movie, and distributing it freely. His work really puts the icing on the cake.